A new way to treat milk allergy is on the cards, thanks to DBV-Technologies! A significant proportion of very young children are affected by what is known as cows’ milk protein allergy. This causes many unpleasant and distressing symptoms, including skin rashes, vomiting and diarrhoea. More worryingly, it brings with it the risk of anaphylactic shock. DBV Technologies have been working on a specific milk allergy treatment that would not only diagnose this allergy, but also reduce its impact on patients. 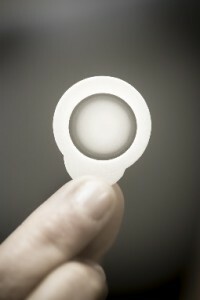 The Viaskin patch (shown below), is one of a family of patches designed for individual allergies. Along with its peanut and egg counterparts, Viaskin milk is composed of an electrostatically charged backing, an adhesive crown and very small quantities of allergen in powdered form (sprayed upon the patch’s backing). Although the allergen dries on contact with the backing, once the patch is placed on the skin, the epidermis’ increased hydration turns the allergen back into liquid form, making it easier for it to penetrate the skin and enter the body’s most tolerogenic cells, the Langerhans cells. As the antigens do not enter into the bloodstream directly, anaphylaxis is much less likely to take place, enabling the patient to slowly build up a tolerance for this particular allergen.